Product Availability: In Stock. Orders normally ship same day if ordered by 2:00PM Est. where is my prescription? it's on the box. Your cart contains an item that was added previously which is different than your current session currency. Please make a selection to continue. This will be the currency that we will charge to your credit card. You have selected 0 as a quantity for one of your lenses. Lens Type : Daily disposable soft contact lenses. 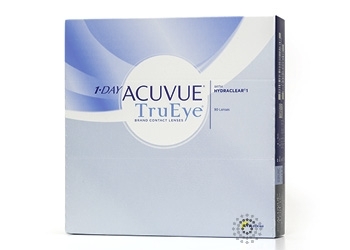 The 1-Day Acuvue® TruEye™ contact lenses, manufactured by Vistakon and offered in a 90 pack format, are the first silicone hydrogel daily disposable lenses to be introduced worldwide. These lenses combine the new Hydraclear® 1 technology, a wetting agent technology, with a revolutionary new material called Narafilcon A that delivers an extremely high level of oxygen transmission to the eye tissues. The material also incorporates UVA and UVB blocking agents to provide the highest UV blocking combination in the industry. These features, along with Vistakon’s patented lens design, delivers an extremely comfortable lens experience that lasts throughout the day. Be sure to follow your eye doctor’s recommended replacement schedule. There are no manufacturer rebates available for this product at this time.